Going from a blank page to a polished document is easier than ever with innovative ways to research information and improve your skills. 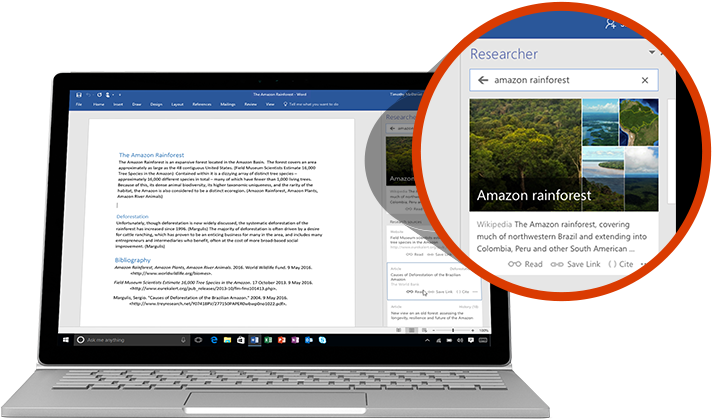 Research without distraction by accessing credible sources right within your Word document. 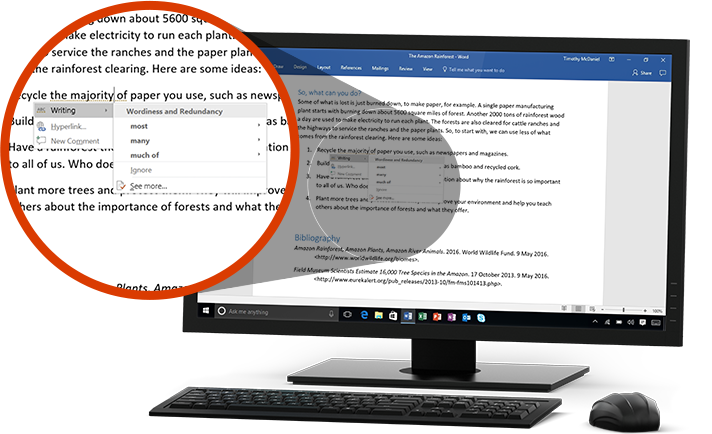 Explore material related to your topic and add what you want—and its properly formatted citation—in one click, with Researcher. Get help making the finishing touches with Editor, an advanced proofing tool that not only checks for spelling and grammar, but makes style suggestions to help you improve your writing. You and your team can chat and co-author documents in real time with Skype integrated into Word. As you make changes to your documents, you can revert back to earlier drafts with the improved version history. Use track changes, and share your thoughts by commenting right next to the text you’re discussing. Everyone can add to the conversation and stay on top of changes to the text, layout, and formatting. Share with a click of a button to quickly invite others to edit or view your documents. Easily manage access permissions and see who’s working in a document.